I first introduced you to Cheese Age waaaay back when I first tried them at Honda-Ya for Son’s birthday. Yeah, I’m a bit behind in my posts, can you tell? 😀 Anyways, I promised you I would try making them and then write a post about them… and I did! Make them anyways. I made them for my great-aunt’s Christmas party the Saturday after Thanksgiving, and they were a hit! One of my great-aunts loved them so much, she took all of the left-overs home! These are addictive. Quite spicy, so I can only eat one at a time and run for water between pieces, but soooo good! Plus, these are a perfect snack to bring for a Super Bowl party! (I’m actually doing this… I’ll make them Saturday, refrigerate them overnight, then send them with Son because unfortunately I can’t be at his friends’ Super Bowl Party this year!) 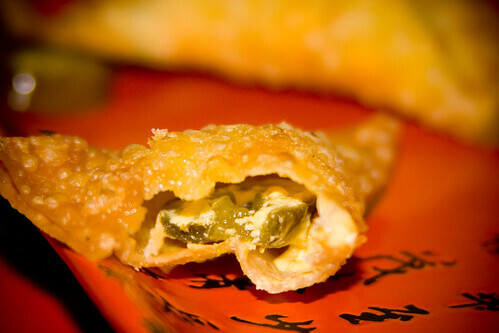 Cheesy, spicy, fried… perfect with a beer or two while watching the big game! Of course, if you are more in the mood for sushi for your Super Bowl party, you can definitely check out our Super Bowl Rock N’ Roll that I made last year (a suggestion by one of our favorite readers, Ralph Whitbeck! 😀 ). 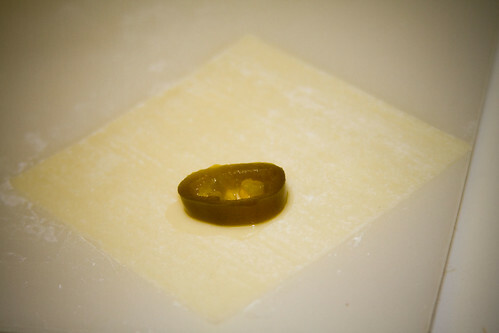 Place a jalapeño slice just below the halfway point of the wonton skin. Break the cheese slice into thirds. 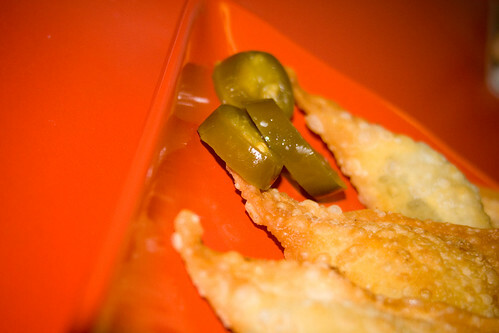 Break each third of the cheese slice into pieces, arrange on top of and around the jalapeño. 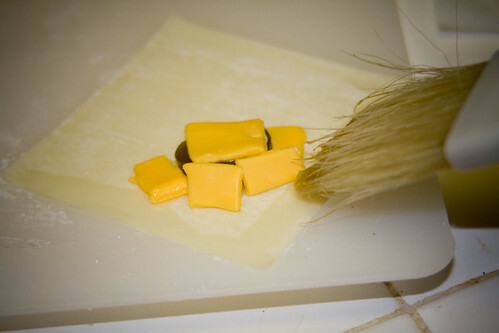 Using a pastry brush ,brush the bottom two edges of the wonton skin with egg white. 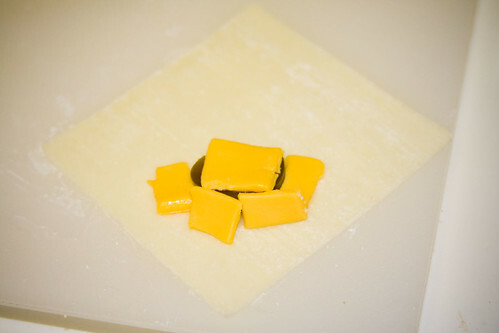 Fold the top half of the wonton skin down over the fillings. 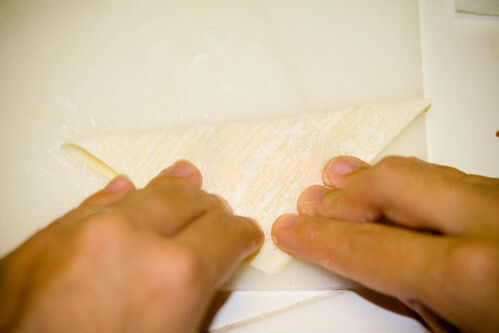 Press the edges together to seal the wonton. Pour enough oil into a frying pan so it is at least an inch deep, heat it until it is hot (sorry, I have no exact temperature for you). 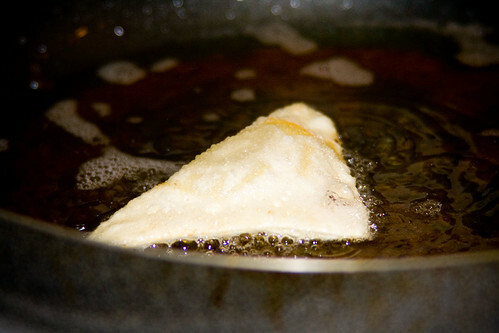 Place one layer of the filled wontons into the pan. 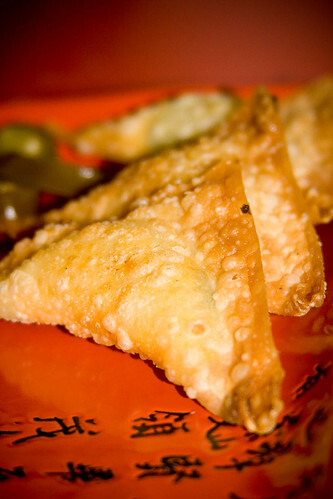 Fry wontons until they are golden brown. When we did this, we found that they expanded quite a bit and would start to leak cheese if one of the sides hit the bottom of the hot pan (which is why we want the oil to be deep enough so this doesnt happen. They look great, we like jalapeÃƒÂ±o and cheese, I’m try to make it. Haha me? Kind to my arteries? Not so much… I wish it were that way here… I cook and then I have to clean! 🙁 Otherwise I would cook a lot more! I hate doing dishes… 😛 I saw those bacon cups… my sister is pestering me to make them for her! Let me know how they turn out… although I’m sure you’ll post something on Feisty Foodie about it!